This is an unabridged reading of Terrance Dicks’s 1978 novelisation of his own serial from the previous year. Dicks doesn’t make many alterations to the original narrative, but then he doesn’t really need to. 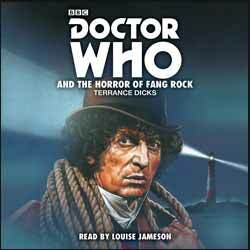 Horror of Fang Rock is an efficient little adventure, with a restricted setting (a lighthouse and its environs) and a limited number of characters (aside from the Doctor and Leela, the lighthouse crew and some shipwreck victims), which get picked off by the monster one by one. It’s pretty much the archetypal ‘base under siege’ structure. Each of the characters stands out in his or her own way, from the superstitious old Reuben to the forward-thinking Ben, and from the impressionable young Vince Hawkins to the unscrupulous Lord Palmerdale. The author adds a prologue about the legendary Beast of Fang Rock, and his descriptions of the Rutan invader make it a scarier proposition than the luminous green bogey that was encountered by Tom Baker on screen. The reader is Louise Jameson, who played Leela. She gives each of the characters a distinctive voice, including the all-important Doctor. In fact, she renders his lines more successfully than her previous attempts to imitate his delivery in Big Finish’s Companion Chronicles series – perhaps because this time she isn’t trying too hard. Unlike Baker, though, she knows how to pronounce the word “chameleon”. Like the lighthouse itself, Horror of Fang Rock – be it on television, in print or on audio – is fairly basic, but sturdy and dependable.